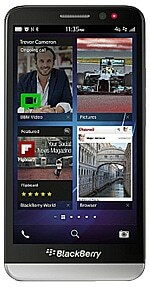 The BlackBerry Z30 is a 5-inch 720p touchscreen smartphone with NFC. The device runs BlackBerry 10 OS version 10.2 and features the largest battery yet in a BlackBerry, giving a claimed 25 hours between charges. The Z30 was announced on 18 September 2013, and will start shipping on 26 September in the UK and the Middle East. The £600 device will be available in other territories later in 2013.